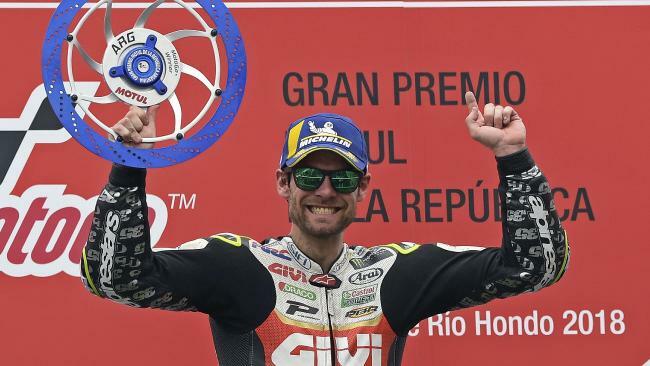 Cal Crutchlow won the MotoGP Grand Prix of Argentina. QUITE frankly, from start to finish, the MotoGP Grand Prix of Argentina defied belief. Where do you even begin... Let's start with the podium: Cal Crutchlow managed his tyres to perfection and fought off a last-lap challenge from Johann Zarco to win his third MotoGP race, while Alex Rins scored his first podium in the premier class for Suzuki, Jack Miller finishing on their tails in fourth. Then there was the beginning: Miller started from pole position with a literal four row head-start. As he did to top qualifying, the Australian was the only one to switch to slick tyres as the field gridded up on a damp but drying track. Every other rider had to return to the pits and fit slicks, a move which delayed the start and earnt them grid penalties, which moved every rider other than Miller back 12 grid positions. Then there was Marc Marquez's race, which almost didn't get started at all. The reigning world champion stalled his bike on the grid, bump started it, then rode the wrong way back to his grid position. It was a move that earnt him a ride through penalty that dropped him to 19th, but such was his pace that he was fifth past the chequered flag. However, he got there via a sequence of aggressive - even by Marquez' standards - moves, culminating in one where he forced Valentino Rossi to crash. That one earnt him a 30 second post-race time penalty for "irresponsible riding", dropping him back to 18th position and out of the world championship points. Through all the drama, the race itself was an absolute cracker. Miller led a four-bike battle for much of the race. Miller's grid advantage allowed him to lead easily at the first corner, Marquez blazing his way from 'sixth' on the grid onto Miller's rear tyre by the end of the lap. 'Front row' starter Dani Pedrosa only made it to the penultimate corner of the opening tour. A pass from Zarco put the Honda onto a damp patch, a nasty high-side crash flicking the Spaniard into the gravel. Marquez blasted past Miller down the back straight to take the lead, only to be handed the ride-through penalty for his grid antics, dropping him to the tail-end of the field. He charged past bike after bike until he squeezed Aprilia's Aleix Espargaro aside for 18th, a move race direction believed was too aggressive, ordering Marquez to give back the spot. It didn't exactly deter his progress. A few laps later he was on the tail of the battle for fifth between Maverick Vinales, Rossi and Andrea Dovizioso. Marquez made short work of the Ducati but made a meal of his move on Rossi, forcing the Yamaha wide and onto the wet grass, with the inevitable consequence of the No.46 hitting the deck. 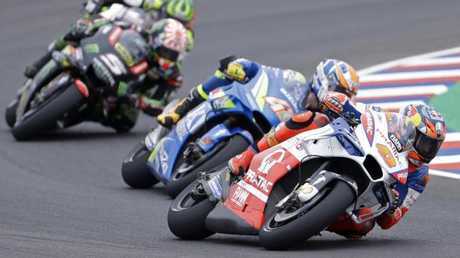 The battle for the lead boiled down to a four-bike shootout between Miller, Rins, Zarco and Crutchlow. Rins poked and probed but couldn't make a move on Miller stick until finally finding his way past with nine laps to go, only to make a mistake a lap later and drop back to the tail of the lead group. Miller's time at the front lasted just one more tour. He ran the Pramac Ducati wide at the penultimate corner and dropped to fourth, and was unable to latch back onto Rins' tail before the chequered flag. That handed Crutchlow the lead, fighting off Zarco on the final tour to take his first win since Phillip Island in 2016. Behind the top four, Vinales resumed fifth once Marquez was given his post-race sanction, with Dovizioso next in sixth. Former Moto2 champion Tito Rabat took his best MotoGP finish in seventh ahead of Andrea Iannone, while Malaysian rookie Hafizh Syahrin rode an impressive race to ninth place ahead of Danilo Petrucci. You then had to scan past the names of Pol Espargaro, Scott Redding, Takaaki Nakagami and Franco Morbidelli to find that of Jorge Lorenzo. The factory Ducati rider had an anonymous race, falling to last on the opening tour and making limited progress after that. An illustration of that is that, despite Marquez copping three separate penalties, at no point did the No.99 Ducati head the No.93 Honda during the race on the road. Then there's the championship battle. Crutchlow now leads the championship - the first British rider to do so since Barry Sheene in 1979 - by three points from Dovizioso, with Zarco a further seven markers back in third. Vinales' consistency sees him fourth ahead of Marquez, while Miller now moves to sixth. The Grand Prix of the Americas in Austin is in a fortnight - and it can't come quickly enough.